Whether it’s ‘jumpers for goalposts’ or something more organised, millions of us are playing football each week. Most of the time, it’s simply a great way to get fit and have fun in the process. But anyone who has played any significant amount of football will have seen injuries occur. Usually these injuries are relatively minor: things like pulled muscles, bumps and bruises. But sometimes, they can be a lot more serious than this, and it’s surprising how few of us are prepared for that situation. Do you Know What to do in a First Aid Emergency? Football should be fun, first a foremost. If you spent all your time dwelling on what might go wrong then you’d probably never leave the house, let alone play football. But have you ever considered whether you’re ready to deal with a first aid emergency? For many of us, it’s easier – more convenient, even – to assume that someone else is going to deal with whatever comes up. That’s a dangerous assumption to make, especially when you’re dealing with a serious incident. 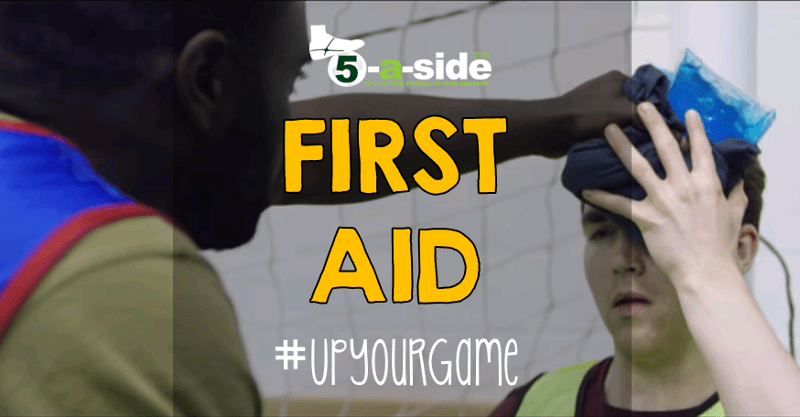 Thankfully, the British Red Cross have launched an #UpYourGame campaign, encouraging footballers to learn essential life saving first aid skills. Consider a situation, where a competitive game of 5-a-side suddenly takes a turn for the worse. Watch this short video and ask yourself when the player gets injured: what would I do? If you didn’t know what to do at first then you’re not alone. New research revealed by the British Red Cross shows that 89% of footballers think sportspeople have a responsibility to look after each other, yet almost half (43%) would not have the confidence to help their teammates in a first aid emergency. Can you #UpYourGame When it Comes to First Aid? The British Red Cross is calling on football players, clubs and coaches to learn the essential skills needed to act in an emergency. The call comes as part of the charity’s #UpYourGame campaign which hopes to encourage an increasingly active British public to learn first aid. One of the startling findings from their survey was the sizeable gap between footballers who have learnt first aid and those who haven’t. Of those who had learnt first aid, 65% reported that they would feel confident and willing to help in a first aid emergency, yet this figure dropped to only 28% when players had not learnt first aid. You might question whether you’d even want the ‘unqualified’ 28% to start trying to help you – although some help is better than none at all. 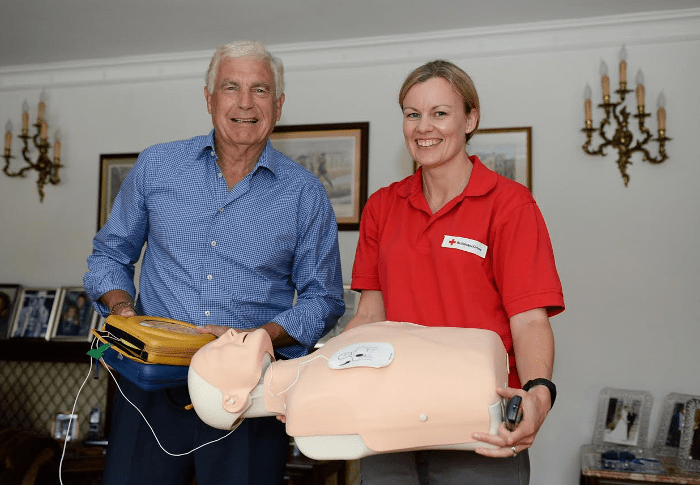 Sir Trevor Brooking CBE, learning first aid. So, where do you go to learn this stuff? The British Red Cross’ Sports First Aid website has lots of free resources that can help. There’s video case studies, a free downloadable first aid guide and even an app with videos and quizzes. What’s more, the British Red Cross also offer first aid courses which will take you into a greater level of depth and provide you with the chance to practice your knowledge under expert supervision. You can also find them on the website mentioned in the previous paragraph. As a player I’ve played in hundreds of games over the years, and only in a handful of situations have I ever seen a severe case that needed urgent medical attention. It’s something you hope that will never happen, but the reality is that it just might. As a qualified football coach, one of the requisites is that you must attend an FA First Aid course, which takes you through the basics of how to deal with various incidents: players not breathing, strokes, and broken bones, for example. It is vital knowledge that shouldn’t just be held by coaches. Players should have this as well. As a player I’ve witnessed people step in and provide first aid in situations that I consider nothing short of heroic. Each time I step out on to the pitch I want to think that if something serious happens to me, then somebody will know what to do and will take the necessary action to help. That’s something most of us implicitly expect, but the British Red Cross’ survey figures confirm that it’s not necessarily something we’re all in a position to provide! Football has a serious side and this is it. When we’re talking about each of our health, and even our lives, that’s something that I believe we all, as a football community, really have to step up our game for. Make it your mission to #UpYourGame today. For more information and ways to improve your first aid knowledge, visit the British Red Cross’ Sports First Aid website. Hi Gaffer – we had a very serious incident about 3 years ago. We were playing our usual weekly 5-a-side game, when after about 20 minutes one of the regular players said that he was feeling short of breath, so he went in goal. When he went in, he stretched his arms out along the crossbar, with his back to the game. We were shouting “Oi, Cliff – face the game” and the next second he collapsed like a bag of spuds on his back onto the blue gym mats in front of the goal. The game stopped instantly and the hall went deadly quiet. We all went over to Cliff, and it was very obvious that he was in a bad way. As I was the organiser, I felt duty bound to take the lead. I shouted for someone to call an ambulance, and then I shouted Cliff’s name in his ear and slapped him around the face. Nothing, not a blink of the eyes (which were open looking straight the the roof), not a murmur, not a twitch on his face, nor his body. We all looked at each other, nothing was said – but we all had the same thought – He’s a gonner. (no – not a Gooner – a gonner). I asked if any one knew First Aid – we all agreed that we did not. So I thought – I’ll give it a go, remembering the Vinnie Jones adverts for CPR – done to the Bee Gees “Stayin’ Alive”. I tried the heart pumping, but things only got worse. One of the other players, Alpesh, tried to find a pulse – but to no avail. Cliff was now dribbling from the side of his mouth, and his eyes had rolled up into his head, so that only the whites of his eyes were visible (like something out of a horror movie). When Cliff’s lips turned blue, I realised that my skills were not up to those of St. Vinnie, so I asked the guys what we should do. Roy (the Welsh Wizard) offered to do “Mouth to Mouth” and we all agreed to let Roy get on with it. We all stood back to let Roy have some air, so he crouched by Cliff’s chest. He pressed his lips close to Cliff’s – at which point Cliff sat bolt upright and shouted “F### off Roy, stop f###ing kissing me”. The tension in the hall disappeared immediately. We rolled Cliff onto his side, into the recovery position, and he seemed fine – if a bit tired. He did not remember anything about the incident (which had lasted about 10 / 15 minutes), and did not know why he was on the mat with everyone around him. The paramedics arrived about 5 minutes later, and a quick check up indicated that he was not in danger. An ambulance arrived after another 10 minutes, and another check up indicated that he was OK to travel to hospital. Cliff walked out of the hall, unsteadily, supported by the ambulance staff and muttering “I played less that half game – I want half my subs back”. The A&E department diagnosed a congenital heart defect, and he need surgery to replace a dodgy heart valve. He had the operation within a week, and is back playing football. It appears that on the night, his dodgy heart valve got stuck, causing the initial shortage of breath, and then the collapse. Our pumping and kissing might had jolted the valve into its correct operation. Cliff said that he had suffered sporadic bouts of shortage of breath in the past, for as long as he could remember, but put it down to asthma or just wheezes. There was a similar incident a few weeks later (not in my game, I hasten to add), but the player was not as lucky as Cliff, as he died. That team bought a Emergency CPR kit for the hall, similar to those held in office blocks and train stations. What a fantastic comment. This deserves its own article. I’m going to make it into a separate post – wonderful, slighly scary, reminder for us all that stuff like this does happen and it’s pretty sobering when it does! Fortunately I’ve never seen a life threatening situation on the pitch. But the thought does scare me, as im not sure I’d know exactly what to do. This article is a timely reminder to me, at least that I need to do something about that. Thanks. Glad it made you think! Although in the vast majority of cases nothing serious ever happens, I just wouldn’t want to have it on my conscience that I was unprepared if it ever did!